Training in Neurological surgery encompasses a vast spectrum of experiences from the clinical bedside to the details of molecular medicine and genetics, from basic general surgical skills to some of the most delicate and complex operations performed by any surgeon, from the use of simple anatomical landmarks to sophisticated neuronavigation systems and tools such as microscopes, endoscopes, and microcatheters. All in the pursue of preventing or correcting the diseases that afflict the different components of the central nervous system, the membranes and bone structures that cover them, and the vessels that provide their blood supply. 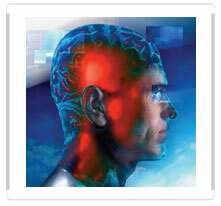 To summarize the complete body of knowledge required to become a neurosurgeon is nearly impossible. However, the education of residents and fellows in neurological surgery requires a detailed structure where every essential milestone is clearly identified and achieved. This array of milestones is rooted in concise concepts of required knowledge, skills, attitudes, and behaviors that are commonly grouped under well-established competencies. As in any medical specialty, six competencies have been clearly defined and the residency training focuses in promoting the growth of the resident in all those facets of their education: patient care, medical knowledge, systems-based practice, professionalism, interpersonal communication skills, and practice-based learning. In surgical specialties there is a seventh fundamental competency: surgical skills. Until now surgical skills are considered part of patient care. However, given the peculiarities of surgical training, this aspect should be conceived as an independent dimension or competency on its own. The majority of these skills are acquired by the residents during several years of practice and participation in the care of patients with neurological disorders. However, in the vast spectrum of processes to be learned an outline, pathway, or curriculum of required minimum knowledge is fundamental. 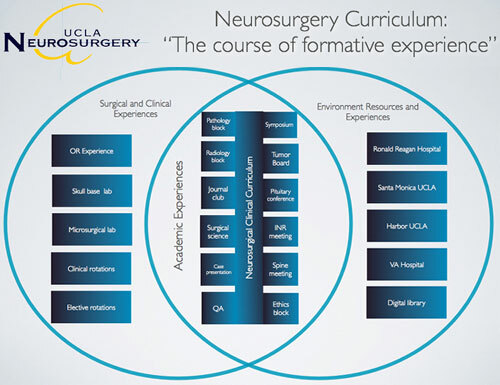 Defining this curriculum should serve as a roadmap to an organized structure of academic, clinical, and technical criteria for the training of residents in Neurological Surgery. 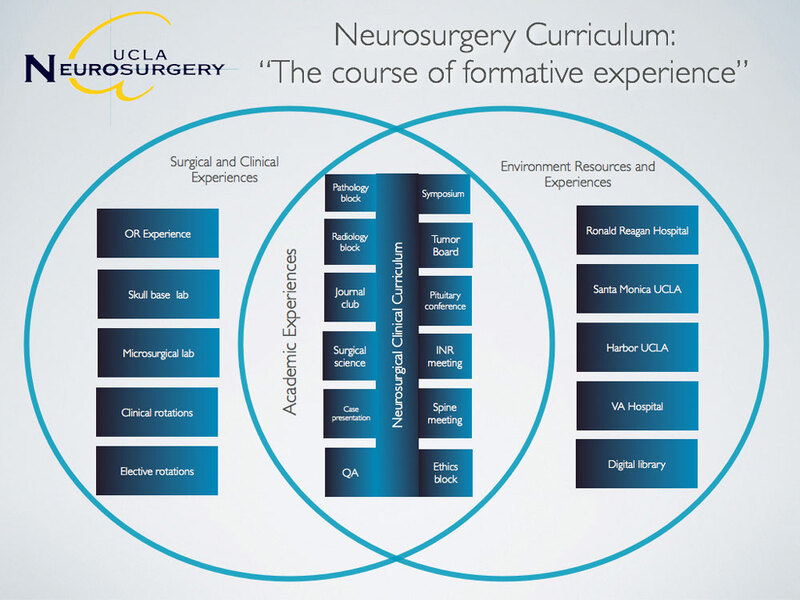 The 100 UCLA Subjects in Neurosurgery constitute a selection of a hundred relevant topics developed by the UCLA Department of Neurosurgery Faculty as an educational tool for residents of all training levels in Neurological Surgery. In addition to the 100 curriculum subjects, this webcast will allow access to the radiology, pathology, anatomy, and ethics conferences of the program, prepared by faculty of our department and affiliated faculty from the departments of Radiology, Pathology, and the David Geffen School of Medicine. Experts from every subspecialty present basic principles, current concepts, and extensive reviews, as well as their own experience and developments in the different fields of Neurosurgery.